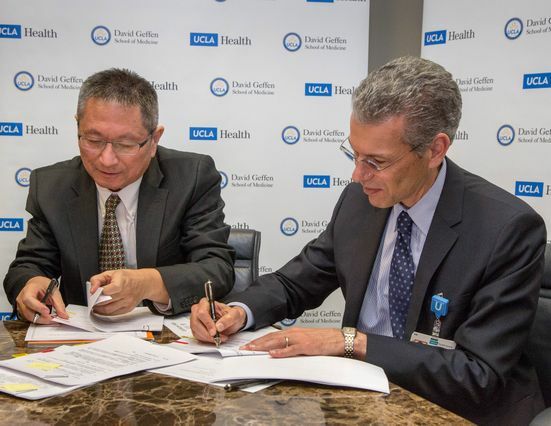 Sangem Hsu, president of CTI, and Dr. David Feinberg, president of UCLA Health System, sign an agreement to operate a joint clinical laboratory in Shanghai. The University of California and UCLA Department of Pathology have signed an agreement with Centre Testing International Corp., a Chinese firm, to create a company that will operate a clinical laboratory in Shanghai. The new lab will support clinical trials and enhance medical care for Chinese patients with cancer and other diseases. The new company, CTI-Pathology/UCLA Health, is jointly owned by CTI and the University of California. The 25,000-square-foot facility — the first of its kind in China — will offer genetic and molecular diagnostics and other sophisticated tests that exceed the scope of the average lab in China, and UCLA pathologists will train Chinese lab specialists to accurately interpret the tests. 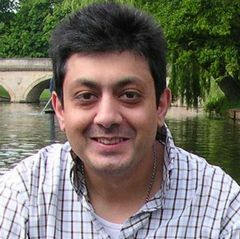 The lab is expected to open in September. The partnership is the first between a Chinese company and a U.S. academic medical center to create a specialized laboratory in China. The agreement was signed Tuesday at Ronald Reagan UCLA Medical Center in a ceremony that was videocast to China. 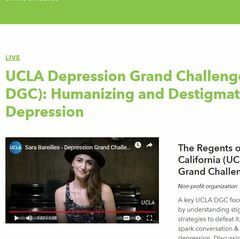 "This joint venture is founded on UCLA's desire to build strong global relationships that, through education, research and service, improve the health of people and communities throughout the world," said Dr. Tom Rosenthal, chief medical officer for UCLA Health System and co-director of UCLA's Center for World Health. "UCLA has a genuine interest in elevating the level of medicine around the world. This is one way we can really make a difference in the quality of the Chinese people's health care and lives." UCLA will oversee management of the laboratory to ensure that its operations meet international standards for quality, and CTI will provide capital funding and marketing expertise. The University of California Regents approved the joint venture on Jan. 22. "We are extremely pleased that the UCLA Health System, UCLA Department of Pathology and the UC Regents agreed to partner with CTI to establish and manage our joint venture laboratory in Shanghai," said Sangem Hsu, president of CTI. "Our collaboration will offer the people of China oncology, pathology and laboratory medicine services they can trust. Many of these services are not largely available in China and are needed by physicians and health care providers to accurately diagnose and treat their patients." The Shanghai laboratory will be electronically and digitally linked with UCLA — enabling physicians and patients to consult with UCLA pathologists — and with hospitals, clinics and other laboratories throughout China. 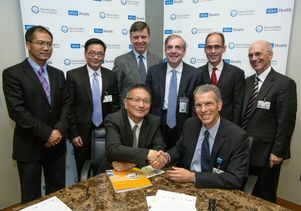 "CTI will be an outstanding partner in our effort to significantly improve patient care in China," said Dr. Scott Binder, senior vice chair of pathology and laboratory medicine at the Geffen School of Medicine, and director of pathology laboratory services for UCLA Health System, which performs more than 7 million tests and diagnose more than 90,000 tissue specimens a year. Binder conceived the idea for a UCLA lab in China and made the first of several visits there in 2005. Dr. Jianyu Rao, a UCLA colleague who speaks Mandarin, helped move the plan forward. "In the past, Chinese medicine focused more on treatment than diagnosis," said Rao, a professor of pathology and laboratory medicine at the Geffen School of Medicine and director of cytopathology at UCLA Health System. "Due to the rise of a more-informed middle class, the Chinese people are recognizing the importance of accurate diagnoses for their conditions." The partnership also has led to teaching exchanges between UCLA and China. UCLA has already hosted Chinese pathologists and technologists for training on specialized diagnostics for skin, blood and brain tissue and other areas. In turn, UCLA pathologists will travel to China to learn about diseases that are common there but rare in the U.S.
"Because pathology has a history of being undervalued in China, the country has a shortage of pathologists trained to diagnose and interpret complex test results in specialized fields of medicine," Binder said. "Our partnership gives CTI and UCLA the opportunity to save lives by changing that." Centre Testing International Corp., a publicly traded company on the Shenzhen Stock Exchange, is China's leading product testing, inspection, certification and consulting firm. Providing comprehensive services for consumer products in nearly every industry, CTI oversees quality control and enables companies to sell their products to markets worldwide. UCLA Health System for more than half a century has provided the best in health care and the latest in medical technology to the people of Los Angeles and the world. Comprising Ronald Reagan UCLA Medical Center; UCLA Medical Center, Santa Monica; the Resnick Neuropsychiatric Hospital at UCLA; Mattel Children's Hospital UCLA; the UCLA Medical Group and a wide network of primary care and specialty care offices throughout the region, UCLA Health is among the most comprehensive and advanced health care systems in the world. 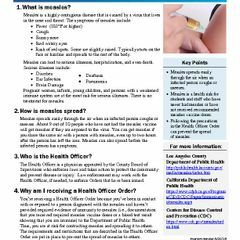 For help choosing a personal physician, call 800-UCLA-MD1.